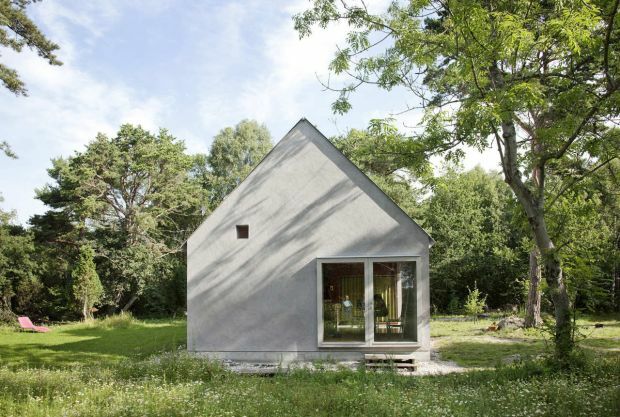 Hamra, as it’s called, is a solid summer house on the island of Gotland in Sweden. As a creative approach to a limited budget, it was designed especially for simplicity and elegance, as the perfect place to take a no-frills vacation and just relax. The adorable little abode offers lots of open space and cross ventilation, as well as lots of beds to sleep one big happy family. Check out these photos, fall in love with the home, and tell us what you think on our facebook page! 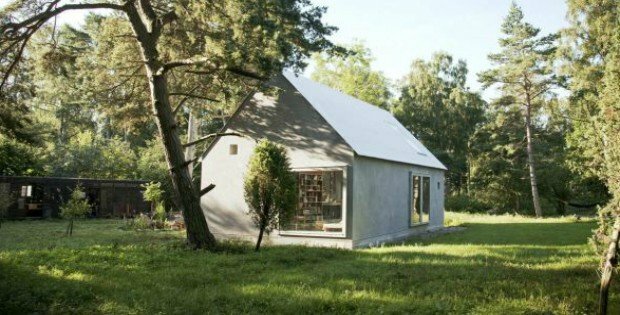 The brief came out of the very limited budget: a house as simple as possible. 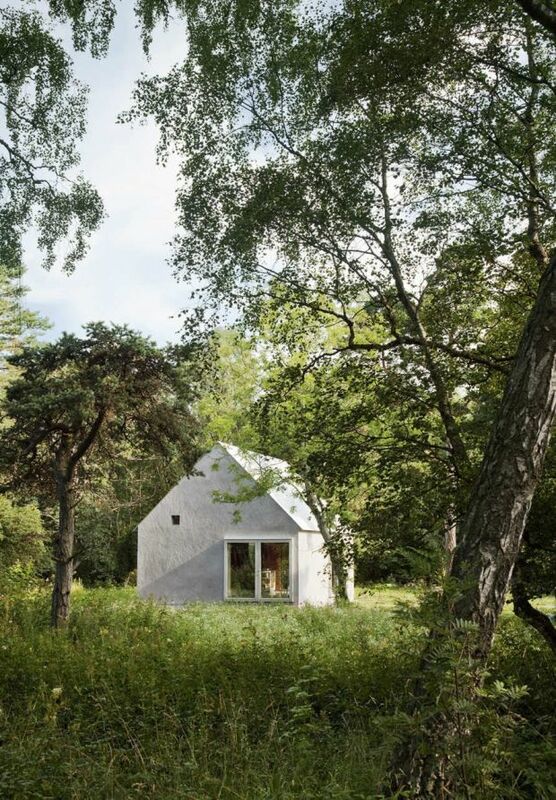 Equally simple as the barn we wanted to convert to a summer dwelling, but which never showed up on the market: one open space with a large number of possible beds, cooking in the middle, washing facilities outside the house. Planing regulations ruled the placement of the house to the inner part of the plot which at the time of designing was still densely vegetated and scarcely accessible. Hence the house was designed with generic qualities, creating no front- or backside, treating all sides of the site equally. Four large openings 2,4x2m are placed according to rotational symmetry, one in each facade. Facing north is a fixed window, the other three are glazed doors. There is no hierarchy between the doors – anyone can be used as an entrance. 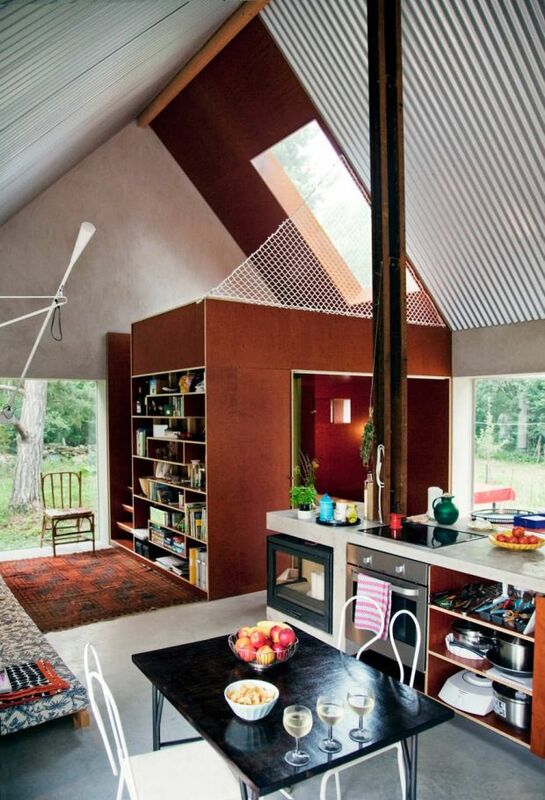 Two roof windows add skylight to the interior. 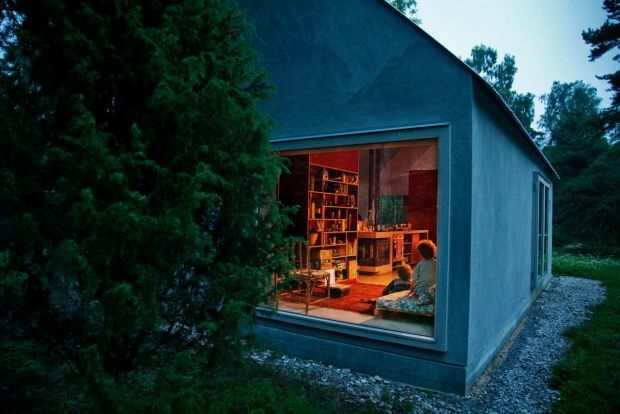 There is a surviving tradition of small-scale window manufacturing on Gotland which made it possible to try the unconventional solution of windows mounted outside the walls which allows them to open up 180 degrees. With the window frame flush to the niche walls and the floor the opening appears from the inside as a clean undetailed hole in the wall. Opening up, the doors are held in place along the facade by a simple spring steel fitting. The interior space is dominated by two plywood volumes which, in and above, offer space to play and to sleep. Around and between these volumes entrance, cooking, dining and living takes place. All serving functions are organized along a 90cm wide strip running through the house. All technical equipment and all water and drainage is located along this strip which limited the complexity of installation work. Spacial functions like stairs, storage, closets, bookshelf etc. are also located along the serving strip. 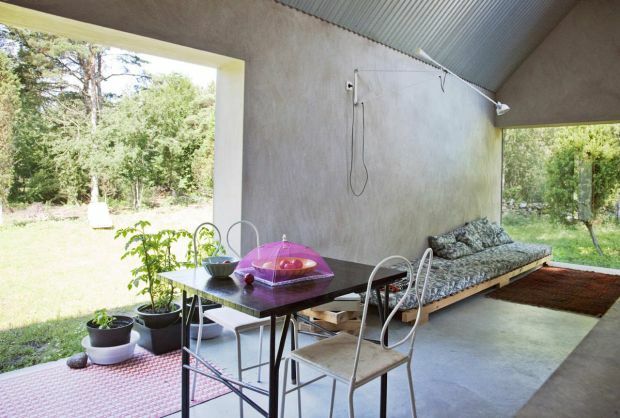 In the middle there is the kitchen which consists of a 3,1mx0,9m concrete bench with an integrated fire-place. It is cast in situ and the cupboards are remaining parts of the cast. In this case the form work plywood has been used for its actual purpose.